Electric ceramic hobs are very popular due to their streamlined designs, easy cleaning and quick heating technology. Elements under the hob provide the heat to the zone required so transfer to the pan is simple and rapid. Many manufacturers offer a range of ceramic hobs, so you can find a style to suit all kitchens including stainless steel, black glass, with touch controls or simple dials. 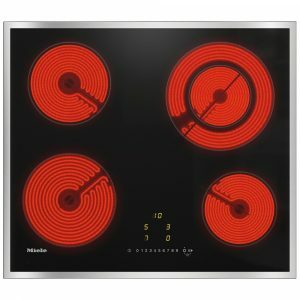 This superb 76cm wide ceramic hob from Miele boasts four heat zones. Finished in black glass with a stainless steel frame it will look great in any kitchen. 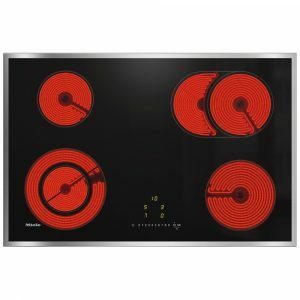 This superb 57cm wide ceramic hob from Miele boasts four heat zones. Finished in black glass with a stainless steel frame it will look great in any kitchen. Not sold on ceramic? Head to our full range of hobs in our cooking section to look at our other options, including induction and mixed fuel hobs. We also have selections of range cookers and built in ovens for you to look at. If you’re in the market for some new hobs, then you should consider taking a look at our fantastic cooker hoods. Our line of air venting induction hobs combine powerful cooking with powerful extraction. If you want to fully kit out your kitchen, we also have some amazing products in our refrigeration section and our small appliances section, like our American-Style fridge freezers and coffee machines. With high-quality products from market-leading brands, Appliance City is your one-stop shop for all the powerful appliances your home needs.